I have been wanting to try a meal delivery service for quite a while now and when one of my girlfriends shared three free meals from Blue Apron, I couldn’t turn down the opportunity to give it a try. When we lived in Houston, we used to pick up dinner kits at Central Market all the time because it made dinner quick and easy (especially on a weeknight!) and using Blue Apron really reminded me of that, and got me excited to make a few new dinners. Our delivery came on Thursday and we made the first of our three meals on Friday evening. 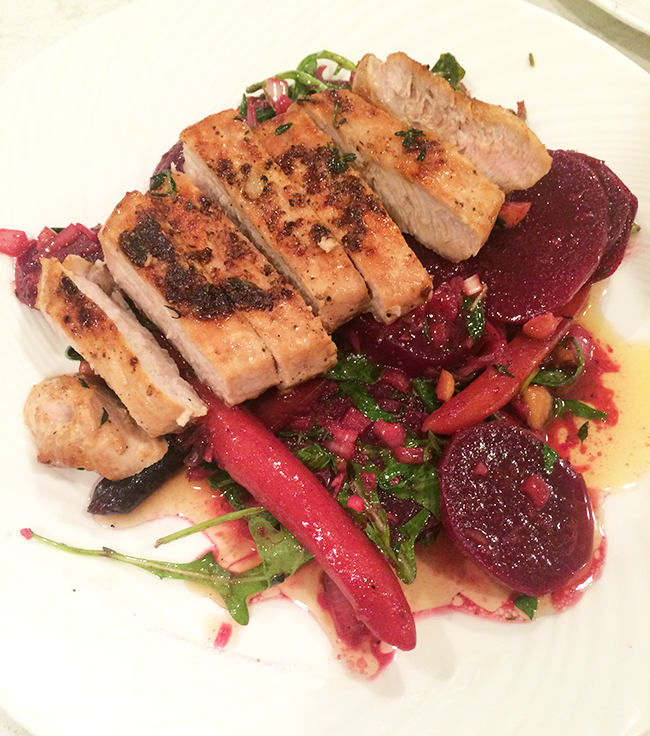 Overall, our first experience with Blue Apron was really very good! 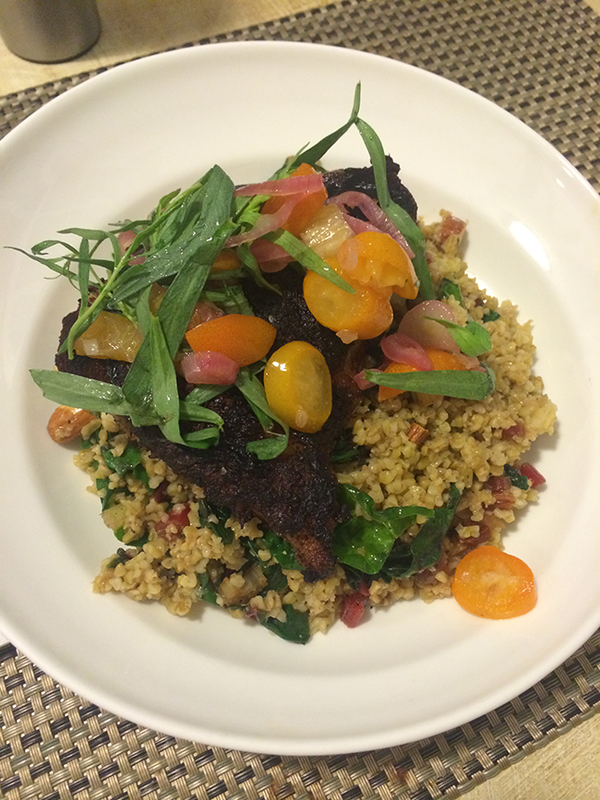 I was impressed by the quality of the ingredients and the organized way that everything arrived. We had chicken thighs with a kumquat relish, pan-roasted salmon in a spicy miso broth and center-cut pork chops with a beet and heirloom carrot salad. 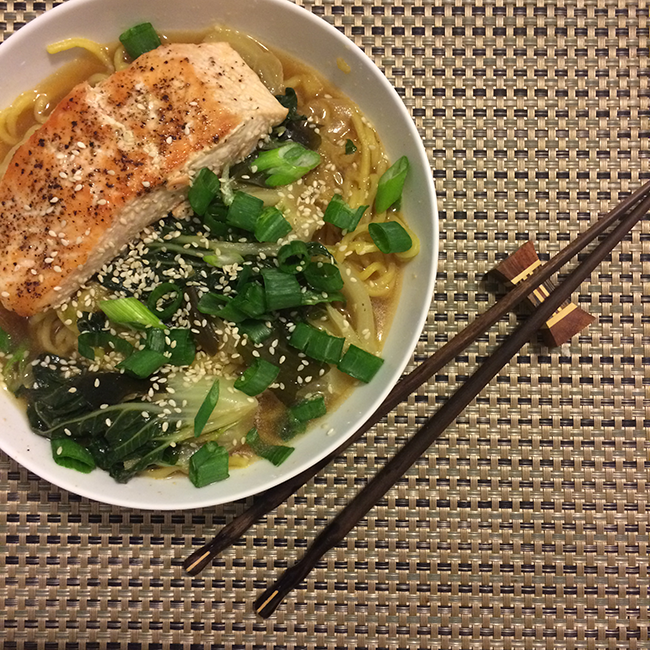 My favorite was the salmon, which was like spicy, fancy ramen and I’d love to find more recipes just like it. Really everything was different for us, and it was fun to try new ingredients (until this weekend I had never cooked beets but they were so good that I may need to make them again!). I found that everything was pretty easy to make, but maybe took a me little longer than expected because they were all new-to-me recipes and I was trying not to mess anything up (and, let’s be honest, I was trying to take photos to share). Jackson didn’t eat any of the meals we made, although we did offer them to him. He’s sort of going through a picky phase anyway, so I just did a little separate grocery shop for him. So, would I order again? Yes, I definitely would. It wouldn’t be an every week thing for us, because I do like to grocery shop and stick to some of our usual meals, along with new found-on-Pinterest recipes, but I could easily see ordering once a month or more during busy times. For example, if we’re looking to change things up a bit, have a busy week ahead or are just coming back from vacation with little time to shop, I would absolutely plan on having a delivery sent to us. If you haven’t tried it but have been wanting to, it is definitely worth it. Check out the latest menus and sign up for your first delivery here.